Why is it that fish have gills and marine mammals do not? How can some whales hold their breath for 90 minutes yet a human can only manage a measly 2 minutes? A recent paper published by Yim et al. gives us an insight into the evolutionary history of the minke whale and into aquatic adaptation of cetaceans. Image: Cetartiodactyla evolutionary tree. Groups in green are part of Artiodactyla. CREDIT: Price, Bininda-Emonds and Gittleman. Whales have had an indecisive evolutionary history, first living in water, then on land and then in water again. The reasons for these changes are complex to understand but a recent study published in Nature Genetics by South Korean researchers, shone light on how marine mammals have successfully adapted to life in water again and, furthermore, how these adaptations compare to fishes that continued to live in water. The entire minke whale genome underwent in-depth sequencing for the first time, along with the partial genomes for other Cetacea – bottlenose dolphin, a fin whale and a finless porpoise. 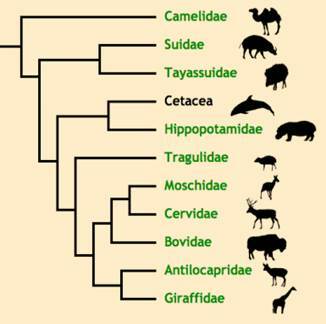 These were then compared to the genomes of some Artiodactyla species – hippopotamus, cow and pig. Genetic differences were used to determine Ceteacea and Artiodactyla adaptations to life in water and on land respectively. Together, Cetacea and Artiodactyla make up the order Cetartiodactyla (see Figure 1), making them closely related phylogenetically. This suggests that genetic differences between them would be indicative of adaptive change. • have 22 chromosomes (similar to humans with 23) and 20,605 genes. If a gene is expanded in whales compared to pigs, it means the gene is found in both species but is used more in whales than pigs. Conversely, a contracted gene is one that is used less. To determine the genome sequence, DNA was extracted from a minke whale and sequenced using Illumina and Sanger sequencing. The genomes of Cetacea and Artiodactyla species were compared to determine genetic adaptations to aquatic life by looking at which genes were expanded between the two groups. On average, the sequences collected were supported by 128 repeats of the same sequence, indicating high reliability for this study. What was found in the minke whale genome? • Body hair genes and olfactory receptor genes were contracted. So how different are whales and pigs? Image: Gene groups shared by dolphin, minke whale, cow and pig genome sequences. Yim et al. 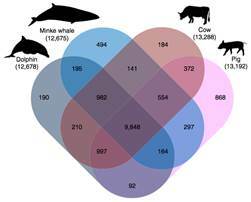 Dolphin, minke whale, cow and pig genomes share 9,848 gene clusters (Figure 2), with only 494 of those being specific to minke whales. The minke whale shares 86% of its gene group with the pig and 88% with the dolphin. Not much of a difference at all, perhaps we’ll be eating dolphin bacon soon? Xuanmin Guang, project manager from the institute where the study was conducted, emphasized the relevance of this study to any future research in marine mammal disease control, species conservation, ecology and evolution. The adaptive success in fishes and marine mammals has to be considered equal. Here we have learned how the minke whale has adapted to marine life, from combating deep-sea diving sickness to ‘losing’ hair to become more streamlined. Genome sequencing for any animal is important to understand species relatedness, but given the minke whale’s large geographical distribution and the resulting ecological impact, this study is likely to shed light on other similar studies as well as creating a platform for the sequencing of other marine mammals. This is a fine summary of a peer-reviewed article, but it should probably be identified as such in the title, possibly by reducing the reference to gills which is not discussed in the text. Is this a preprint or a blog post, or what? How are the authors related to the authors of the peer-reviewed article and the "additional contributors" listed at the end of this piece? The summary could be improved by including some discussion of other key findings of the article. Foremost is the expansion of genetic families encoding stress-related proteins and salt tolerance.